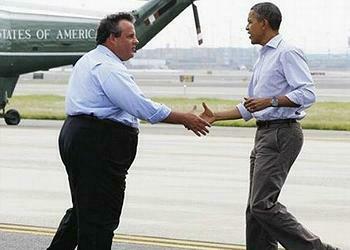 WASHINGTON, DC, October 31, 2012 (ENS) – President Barack Obama joined New Jersey Governor Chris Christie today for a survey of the destruction left by Hurricane Sandy, which battered the East Coast on Monday. The President has issued a major disaster declaration for New Jersey, among a dozen other states, which qualifies them for federal funding to rebuild infrastructure and recover some losses. 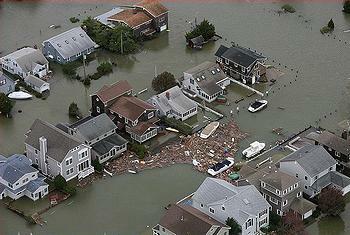 New Jersey was hardest hit of all 17 states affected by the giant storm. The superstorm has been blamed for eight deaths in the state due to falling trees, drownings, and crushed vehicles. Across the United States, at least 62 people lost their lives. After a helicopter ride along the entire New Jersey coast, the President and Governor Christie stopped to speak with people at the community center in Brigantine, about six miles north of Atlantic City, where the hurricane made landfall about 8 pm Monday night. For New Jersey residents whose homes are not habitable, Obama said Federal Emergency Management Agency Administrator Craig Fugate will get them into alternative housing quickly. “We’re going to not tolerate any red tape. We’re not going to tolerate any bureaucracy. We’re going to make sure that we get the help to you as quickly as we can,” promised Obama. The formal “alert” status at Exelon’s Oyster Creek nuclear power plant in Lacey Township was terminated at 3:52 am today after the water levels at the plant’s intake system decreased to normal levels, the Nuclear Regulatory Commission confirmed this morning. Offsite power has been restored to the nuclear power facility, which had lost electrical service due to Hurricane Sandy and was using backup generators to power water pumps that cool the nuclear fuel. In Hoboken, New Jersey on the Hudson River, National Guard troops, Hoboken Office of Emergency Management members and volunteers worked Wednesday to rescue thousands of residents stranded in their homes by floodwaters contaminated with sewage. Most of the low-lying land on the west side of the city of 50,000 was inundated by Hurricane Sandy, but now the water is slowly receding. Army trucks are bringing ready-to-eat meals to Hoboken residents stranded in homes who cannot be rescued from their homes. More than 2.38 million homes and businesses are still without power across New Jersey out of 3.9 million total electricity customers in the state, according to the major utilities’ websites. The U.S. Environmental Protection Agency, in coordination with the Department of Energy, has exercised its authority under the Clean Air Act to temporarily waive federal clean diesel fuel requirements in New Jersey to allow the use of home heating oil in most generators and pumps in emergency service in New Jersey if the ultra low-sulfur fuel usually required is not available. Lower Manhattan was flooded by a record storm surge of nearly 14 feet. The floodwaters entered the subway system and led to power outages for most of the borough below 39th Street that are still ongoing. FEMA Administrator Fugate told reporters aboard Air Force One that teams are still on search and rescue duty. “We still do not have the primary all-clear. So we are still checking and looking for people. We’re hoping that we’ve gotten to all the living, and now the next step will be to go and look for those that were lost, particularly in the fires, the flooding. 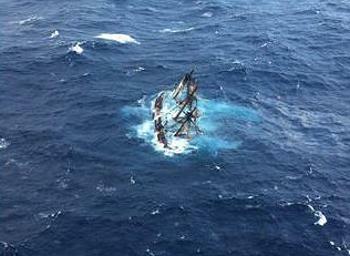 The Coast Guard still has an active search on for the missing captain off of the HMS Bounty. New York City is slowly coming back to life. Buses returned to service today and no fares were charged, but subways are still out. Crowds of people walked across the Brooklyn Bridge to get into Manhattan for work. The New York Stock Exchange opened after being closed for two consecutive days due to weather, the first time since 1888. But the NYSE was operating on generator power, as electricity is still out for the entire lower half of Manhattan. As of 11 am, Con Edison crews were working to restore power to about 786,000 New York customers still without service. That includes some 237,000 customers in Manhattan, 115,000 in Staten Island, 109,000 in Queens, 108,000 in Brooklyn, 40,000 in the Bronx, and 176,000 in Westchester County. The utility company today distributed ice to customers without power in all five boroughs and in Westchester in an attempt to keep their food from spoiling. Con Edison said that customers in Manhattan and Brooklyn who are served by underground electric equipment should have power back within three days. Restoration to all customers in other areas served by overhead power lines will take at least a week. In areas served by underground electrical equipment damaged by the largest storm surge in New York City history, the equipment must be cleaned of seawater, dried, inspected and tested before it can be safely placed back in service. Con Edison has secured assistance from 1,400 external contractors and mutual aid workers from utilities as far west as California. Flights resumed at Kennedy and Newark airports on a limited schedule. LaGuardia Airport, which suffered far worse damage, is still closed. U.S. Coast Guard air crews from Elizabeth City, North Carolina rescued sailors from the tall ship Bounty on Monday during the storm. 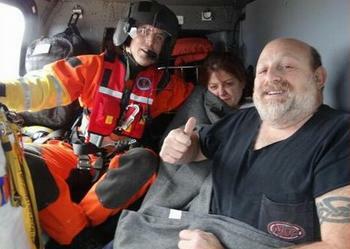 Two Jayhawk aircrews hoisted 14 survivors from the 180-foot sailboat after the survivors abandoned the ship when it began taking on water 90 miles southeast of Cape Hatteras, during Hurricane Sandy. Of the 16-person crew, the Coast Guard rescued 14, and is searching for the captain of the vessel, Robin Walbridge. The body of deckhand Claudene Christian was found Monday evening, the Coast Guard announced. U.S. Transportation Secretary Ray LaHood Tuesday made $13 million in quick release emergency relief funds immediately available to New York and Rhode Island to help begin repairing the damage caused by Hurricane Sandy, while assessments continue throughout the Northeast to determine the full extent of the damage. Rhode Island will use the funding to repair damaged sea walls supporting roadways; New York will use it for general emergency repairs to federal aid highways. The release of funds was made possible by disaster declarations approved by President Barack Obama, which make federal funding available to supplement state and local response and recovery efforts. The $13 million represents 100 percent of the state-requested funds – $10 million from New York and $3 million from Rhode Island. These two requests are just the first to arrive at the Department of Transportation and represent the first installment of federal-aid highway funds to help repair roads, bridges and tunnels in these two states. DOT is expecting other states impacted by Hurricane Sandy to apply for additional emergency relief funding in the coming days.